Eastern seaboard operator Gypsum Transportation provided a beacon for the industry when it nominated a camshaftless, electronically controlled Sulzer diesel engine for its 50,000-dwt-bulker newbuild project. Now, the interests behind a Mediterranean reefership scheme have also endorsed the concept, which represents a milestone in twostroke technology, and signals a step change in large diesel engine operating flexibility. In one sense, MAN B&W stole a march on arch-rival Wartsila through the recent conversion at sea of a low-speed, MC-series propulsion engine to full electronic control. However, Wartsila's latest success in sealing contracts for two Sulzer engines configured from the outset for operation in electronic mode gives new commercial succour to the group's technological drive. As with Gypsum Transportation's selfunloader, due to be commissioned in July, a newly-booked pair of reefer vessels for the Israeli export trade will provide an operating platform for the innovative Sulzer RT-flex system. Just as the results from the extended, 10,000-hour test of the 6L60MC electronic engine in the chemtanker Bow Cecil will influence the future MAN B&W two-stroke program, the RT-flex contracts have potentially enormous, long-term significance for Wartsila's low-speed engine business and future technological endeavors. If shipowners can realize the gains in reliability, economy and flexibility across the complete engine operating profile promised by the advocates of the electronic mode, demand for such plant will surely accelerate. The capital cost of low-speed machinery employing computerized fuel injection and valve actuation, relative to the conventional, camshaft-fitted product, would not appear to be an issue. Rather, and in time-honored fashion, the shipping industry will be looking to a fair spread of operating and performance results from such a fundamental change in engine design before it unreservedly embraces the technology. The Sulzer RT-flex system applies common-rail fuel injection to the low-speed sector. Common-rail systems, first used on smaller types of four-stroke machinery, are also being introduced to the large medium-speed diesel category, as demonstrated by Wartsila's unfolding EnviroEngine program. Extensive tests on the group's full-sized research engine at Winterthur, Switzerland, show that the RT-flex layout is conducive to operation on the same grades of high viscosity, heavy fuel oil as ingested by standard RTA-series engines. The electronic two-stroke Sulzer engines specified for two 13,200-dwt reeferships ordered from a Portuguese yard will have the same cylinder diameter, albeit with a longer stroke and a seven-cylinder rather than six-cylinder arrangement, as MAN B&W's first electronic 6L60MC power unit in Bow Cecil. Each Sulzer 7RT-flex60C engine will deliver 22,470-bhp (16,520-kW) to ensure the 21.3-knot service speed required by Israel's Agricultural Export Co. (Agrexco) for its new, combined pallet and container-carrying new vessels. Ordered from Estaleiros Navais de Viana do Castelo, the ships are destined for the fresh produce traffic from the eastern Mediterranean to France and Spain. German technical, design and finance-raising influence in the newbuild project is substantial. Wartsila said that the owner's expectations with regard to operational economy and environmental standards led to the adoption of RT-flex technology. The first Sulzer RT-flex production engine has been manufactured by Hyundai Heavy Industries for transfer across the Ulsan peninsula to Hyundai Mipo Dockyard, where the recipient, self-unloading bulkship for Gypsum Transportation is taking shape. Also described as the first "smokeless" engine in the two-stroke category, the 6RT-flex58T-B was chosen for its favorable exhaust emission characteristics and overall fuel efficiency, including performance at non-optimum speeds. The conversion of the 6L60MC main engine in Odfjell's stainless steel chemtanker Bow Cecil has made the muchvaunted Intelligent Engine concept a seagoing reality. 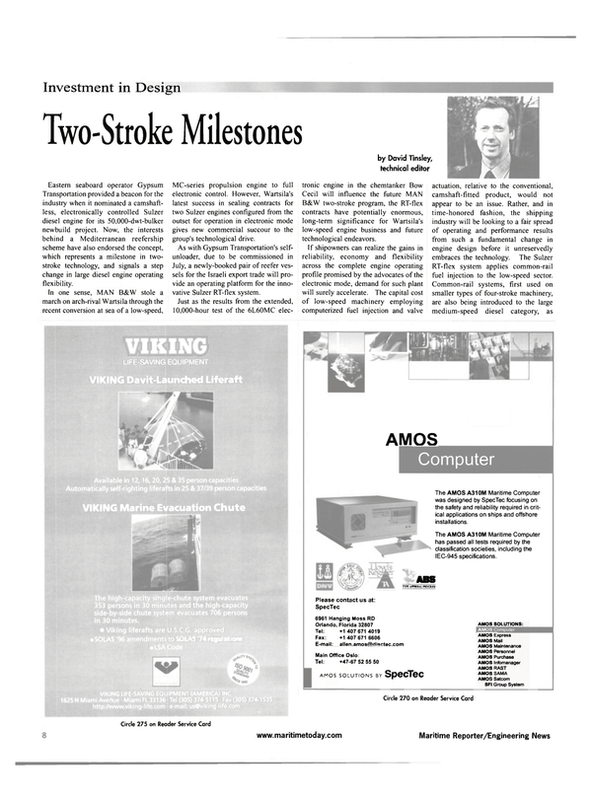 With the two-stroke unit in the 1998-built vessel already prepared for switchover, the adaptation from standard camshaft operation to fully-computerized fuel injection and valve actuation was accomplished in just an hour and a half, with the ship lying off Borneo. "This event is the climax of 10 years of dedicated development efforts to pave the way for a future generation of extremely reliable engines with comprehensive flexibility in terms of operating modes," stated MAN B&W. Another milestone is in sight: Concordia Maritime's two V-max crude carriers, due for delivery by Hyundai in the spring, will each be powered by twin MAN B&W two-stroke engines arranged for conversion to electronic control at each ship's first scheduled drydocking. Getting the measure of pods The industry's uptake of podded, azimuthing electric drives has proved to be one of the most pronounced technical trends of recent years, most especially as regards the cruise ship and specialized vessel categories. New and upcoming applications in the crude carrier, products tanker and RoRo passenger ferry sectors attest to an ever-widening appreciation of the design and operational merits of podded electric propulsors. As with any area of innovation, though, it is important that the ongoing design process is attuned to actual operating experience in the field. Hydromechanical and structural performance have been thoroughly investigated numerically and by means of model testing. However, since the preponderance of seagoing systems date from as recently as 1998, the basis for demonstrating the long-term integrity and reliability of the concept remains theoretical. A three-year, pan-industry study program drawing in extensive European and U.S. participation will provide an important conduit for service results with pod systems. Called Pods in Service. and coordinated by the Dutch Maritime Research Institute MARIN, the project is intended to assess and evaluate the reliability and integrity of podded propulsors under operational conditions. In measuring performance, loads encountered by pods and the dynamic response of the pods and the vessel hull throughout the ship's service pattern, including extreme conditions, a key objective is to provide a method for determining and reflecting such loads at the design stage. The breadth of ascription by shipowners, yards, pod manufacturers and classification societies and other bodies to the joint industry project militates in favor of a productive exchange of knowledge and experience. There are 24 partners in total. The pragmatic nature of the endeavor is underscored by the fact that measurement campaigns will be conducted aboard four vessels equipped with three differ- ent pod systems. The first ship to provide an operational focus is the Finnish combined icebreaker and supply vessel Botnica. Three newbuildings will enter the program on delivery, namely Royal Caribbean's Radiance of the Seas, Celebrity Cruises' Millennium-class Summit, and one of two diesel-electric RoPax ferries under construction for Germany's TT-Line.